The first thing you need to know about barbecue is it ain’t grilling. Yes, your plate of sweet-and-steaming ribs might come finished with a grill-marked kiss. But the fall-off-the-bone texture essential to all types of BBQ and BBQ styles? That comes from slow smoking and indirect heat. Barbecue’s unfolding flavors of wood, ash, and earth? That comes from coals burned down from hickory, pecan, oak, and apple wood. Slow smoking and natural wood—that’s barbecue. And this is your Barbecue Style Guide. We’ll get to some exceptions and fun variations to this rule. But first, let’s dig into the four major styles you’ll come across on many a menu—the signature meat, sauce, and specialty sides of these styles. Because while we may define “barbecue” as “meat and smoke,” variations and types of BBQ abound beyond that definition. And with so many restaurants and caterers offering differing styles, there’s always a good reason to follow the scent of a new smoke. Notable Dishes: North Carolinians are loyal to pork, no matter whether their style is East or West. In Western North Carolina, you see more shoulder. In eastern North Carolina, we’re talking about smokin’ the whole hog, the crispy skin yielding to meat that’s sweet and tender. After fully smoked to piggy perfection, the lot gets chopped to bits. 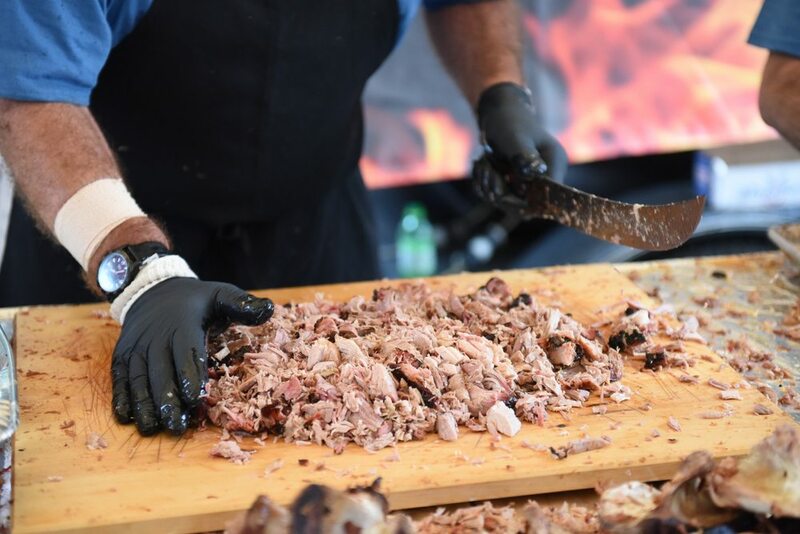 (Often, the pitmaster uses one hand to hold the cleaver, leaving the other on his belt loop or holding a glass.) Both crackly skin and juicy meat get piled onto soft rolls or plated up. Sauce: The simplest of all BBQ styles of sauces, the North Carolina sauce is tangy. A sauce high in vinegar—often both white and apple cider—gets lightly sweetened with a touch of brown sugar and a dash of something spicy. Maybe chili flakes are tossed in. Maybe Tabasco sauce is used. Black pepper is a favorite addition. Sometimes, the result is rather spicy. Sometimes, it’s just high in tang. Guaranteed, it’s delicious. Sides: Little nuggets of cornmeal and onion bound by buttermilk and fried hush puppies are the state’s gift to happy summer days. Grown abundantly across the state, fried okra is also a regional favorite. Similarly tossed in buttermilk and cornmeal batter, fried okra is the snackiest way to get your daily dose of veggies. Arrogant Swine delivers NYC’s first smoked whole hog. Hog truly tests the skills of every pitmaster, so if you find the dish in urban environments like NYC, it’s likely impressive. OneWay Smokehouse & Grill in Charlotte, North Carolina, dishes up vinegar-and-spice-heavy barbecue in the East Carolina style. The Mr. Pig Stuff team began smoking whole hogs in the 1980s. Today, their extensive menu of pulled pork, ribs, and chopped beef brisket combines a few styles to fully satisfy Minneapolis eaters. Sauce: …Yellow mustard sauce. Swap out one part of North Carolina’s vinegar for yellow mustard, and there you go. Tomato-based and vinegar sauces are among the various BBQ styles in SC. But for regional specialty, look to mustard. Sides: With so many ports on the water bringing in bananas to South Carolina, banana pudding is especially beloved here. But for a side (so loved it’s often a main), go for the dish South Carolina-born chef Elliot Moss of Buxton Hall Barbecue tells Food Republic is “like crack”: pork hash. Sure, it’s an extreme analogy. But it’s one echoed amongst loyal South Carolinians. Pork hash can be made from offcuts like hog’s head, livers, and kidneys, or from ham and shoulder prime cuts—the pitmaster calls the shots. Admittedly, pork hash is an acquired taste to outsiders, a call to the brave: give it a shot. With twelve locations across South Carolina, Maurice’s Piggie Park delivers pulled-pork hash over rice, pork as well as ribs, sliders, and brisket and fried chicken, too. For almost twenty years, Carter’s BBQ of Mulberry, Florida, has specialized in barbecue catering. Its mustard-laced chopped pork, chopped beef, and barbecue ribs and chicken are must-tries, topped off with sweet-potato pie. Notable Dishes: Out of all the regions loyal to distinct types of BBQ, Memphis is best known for playing a little fun and loose. You want ribs? Memphis has got your ribs, with both whole spare ribs and St. Louis ribs (that’s a cut of meat with the tips removed). Pulled pork gets a regional twist when plated primarily on a roll covered with coleslaw. Those are tame compared to barbecue nachos and a sweet-and-smoky barbecue spaghetti—as in, barbecue on top of spaghetti—which Southern Living calls an “iconic” Memphis barbecue dish. Sauce: You’ll find Memphis’s signature tangy barbecue sauce of tomatoes, vinegar, molasses, and brown sugar everywhere. But regional winners start smoking meats with a dry rub and end the process with no further saucing. A blend often containing twenty-plus seasonings including paprika, ginger, onion powder, celery salt, fennel, cumin, garlic, and white and brown sugar, the low-and-slow infused crust is full of flavor and wants for nothing. Sides: Onion rings and onion loaf—basically onion rings smushed into a loaf pan, baked, and served with barbecue sauce. The folks in Memphis make these dishes, too. They’re delicious. At Union72 Barbecue in Tampa, Florida, pulled-pork or chopped-chicken sandwiches come with sauce options such as Memphis-style sweet BBQ, spicy BBQ, smoked tomato BBQ, and Alabama White Sauce (mayonnaise-based, more below). Memphis-based Sticky Fingers smokes meat over hickory wood, then finishes the dish off with one of many sauces. Choose from its sweet Memphis Original to its mustardy Carolina Classic. Find locations spread throughout the South. Notable Dishes: Welcome to beef and sausage country. Texas boasts a BBQ that the New York Times describes as “more dry than wet, more fat than lean, more beef than pork, and more anti-fork and anti-plate than your mother probably taught you.” Depending on region and the preferences of the pitmaster, brisket runs from the lean “first cut” to the fat-heavy whole, and can come out tender like an American pot roast or tangy like a German brine. But it still comes down to that slow smoking—tender meat is key. Sauce: Sauce is not “the thing” in Texas, compared to other BBQ styles. 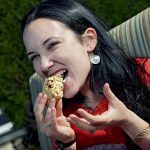 You’ll find everything or nothing, depending on where you eat. Sides: Sides are as ample as the great state is wide. Vinegar slaw is the most popular. Next is a creamy mayo-based slaw, slightly runny mix of pinto beans, and baked beans. Get used to seeing a plate of brisket served with a stack of white bread—make a sandwich (or five) your way, and God Bless Texas. 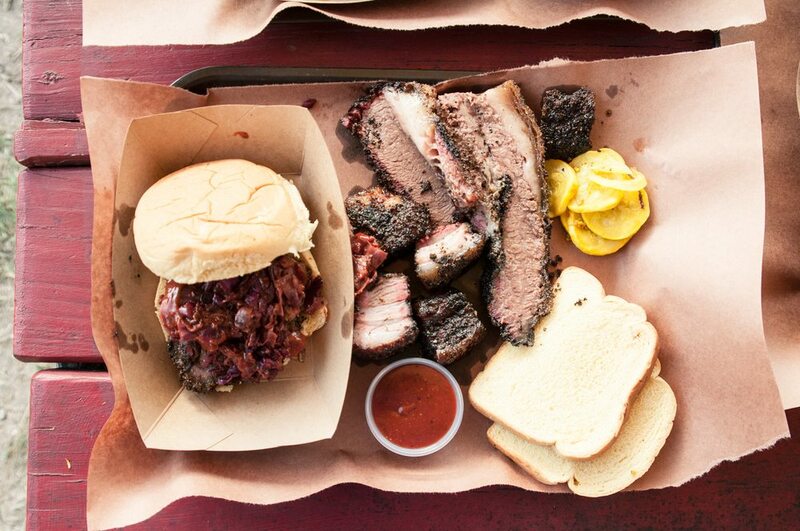 Regional loyalty be darned, NorCal-ers know happy-inducing barbecue when they taste it. In San Francisco, Seismic BBQ drops down some Texas-style brisket with Tennessee-style banana pudding and fiery horseradish-infused coleslaw. The Proper Pig Smokehouse in Ohio wins big for its Texas-style brisket, beef hot links, and pulled pork. 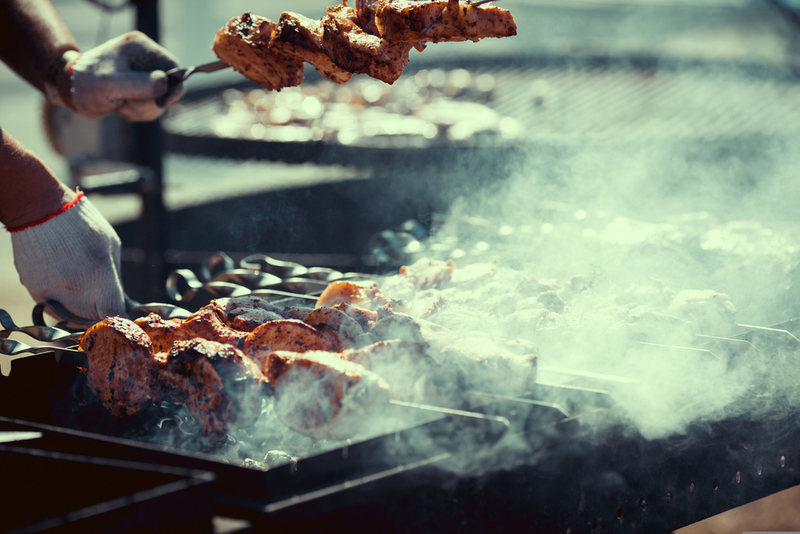 Those four regions cover the most common types of BBQ and BBQ styles you’ll find across menus. But specialty dishes cross state lines and blossom into their own delicious new selves. Here are a few to order up when you spot them. 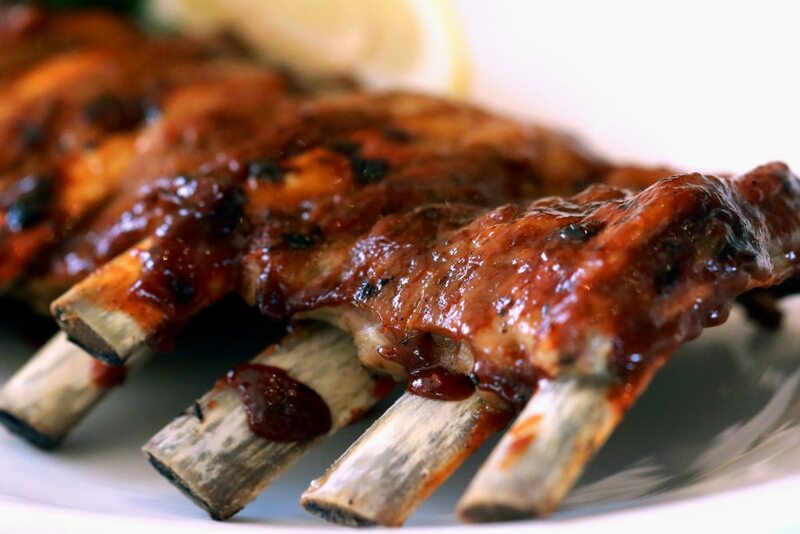 Kentucky BBQ: True in the “meat plus smoke” definition, Kentucky is known for smoking lamb and serving that up with a sauce tinged with black pepper and Worcestershire sauce. It’s not easy to find out of state, but Thrillist loves the mutton (lamb) barbecue at Moonlite Bar-B-Q Inn in Owensboro, Kentucky, so much, they declare “there’s gonna be a mutton boom in 2018.” Keep an eye out. Kansas City: When you see burnt ends on a menu, order them. Brisket point tips cooked down truly low and slow, these little meat nuggets often come lightly slathered in the sweet, thick Kansas City-style sauce that’s what we think of when we think of “BBQ.” Find them at Smokin’ Joe’s BBQ in Kansas City and Mighty Quinn’s in New York. Chicago: When you don’t have room to smoke in a pit, you get creative. “Pit-style BBQ” means meat smoked in metal oven-like containers. It’s delicious. Try it at Pork & Mindy’s in the Windy City and probably elsewhere very soon, too. Alabama: Home to Alabama White Sauce with mayo, vinegar, lemon, black pepper, and salt. 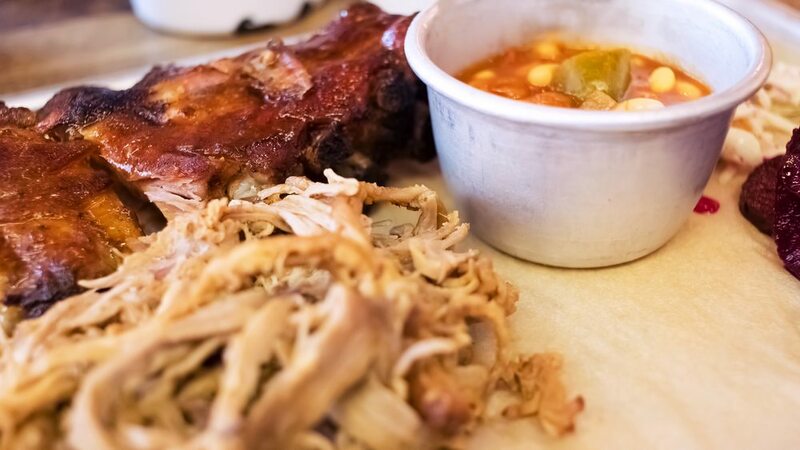 Check it out from Alabama to Maine at Moe’s Original BBQ. Hawaiian BBQ: Hawaiian BBQ almost fits our definition of classic American barbecue with its dish kalua pork: the pork is traditionally smoked by means of hot stones in an underground oven called an imu. Other classic Hawaiian barbecue dishes come off the grill. Find kalua pork and more at Chris’ Ono Grinds Island Grill in San Diego, California. Korean BBQ: Korean barbecue is technically grilled food. But it is delicious grilled food. Find lunch boxes of bulgolgi (Korean-style barbecue beef), spicy pork, and more in New York City at Kore Cafe and Deli. Still hungry? Get ready to ramen with our Ramen Style Guide.